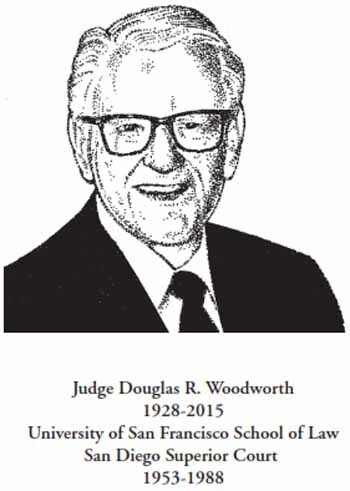 Judge Douglas Rand Woodworth was born on April 14, 1928 in Los Angeles, California. At the age of 16 he enrolled at Stanford University and graduated in 1948 with a degree in international relations. While working full time, Doug attended night school at the University of San Francisco School of Law, graduating in 1952. In 1953 Doug and his young family moved to San Diego, where he built his civil law practice. He was a partner in the firm Stickney, Ortlieb, Woodworth and Moats before starting a solo practice. In 1968, at the age of 40, he was appointed by Governor Ronald Reagan to the Municipal Court. He was elevated to the Superior Court in 1972. Doug formally retired from the bench in 1988 though he continued to work by assignment as a “substitute judge" for many years. In addition to his career in law, first as an attorney in private practice and later serving over 20 years as a judge, Doug was a stamp collector, bridge player, language buff, and world traveler. He was also active in civic service. Doug was a Shriner and a member of the Lions Club. He served on the Committee of 100, the board of Campfire Girls and was active in the San Diego Bar Association, where he also contributed many articles to its newsletter. Doug shared his sense of civic obligation with his grandchildren by taking them to make donations to the San Diego Rescue Mission annually for the past 30 years.